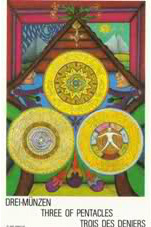 Today's Draw: Three of Pentacles from the Neuzeit Tarot. Are you a consumer advocate? When you complain, do you usually escalate your complaint to the top of the organization? And how would you feel if a terrorist were out there with proof they live in your home? As the little french book (lfb) that accompanies this deck says, this is a good card for the investment, management and handling of money. It just so happens that I spent most of day distracted by just that. So my gas company, Washington Gas (aks MEAN Washington Gas), sent me a "final bill" for my gas services. I thought this was odd, so I called them. They told me someone else lives at my house now and has put the account in their name. I assured them this was not true. Turns out that anyone can cancel your service and put it in their name. ANYONE. Without your knowledge. Which is great if you think they're going to pay the bills. But they won't. First of all, they'll get bills delivered to them electronically so you will never even know you're in arrears. Then they'll use that bill to prove they live at your house. And they'll use that information for god only knows what—I'm not a criminal! But I do know in the past I've been asked to show a bill to prove my residence, so that's what they'll use it for. And who knows what else in this day and age? The 911 terrorists all had Virginia licenses because they are so easy to get in VA. Back in the day, all you needed was third-party verification of residence (aka gas bill) and you've got a license! And the kicker is, when they don't pay your gas bill, you lose your gas service. By that time, their "crime" has been committed and they're nowhere to be found. Or they've driven a panel truck full of explosives legally into DC and left behind nothing but a VA license with MY address on it. Next thing you know there's an armed SWAT team bursting down my door when I'm bleaching my lady moustache! OK. So I don't have a moustache. And I don't really know what someone can do TODAY with "proof they live at my address", but I have no doubt they're using it for evil. Unless it was just a clerical error. In which case it's exposed a HUGE threat to our national security. I mean, this stealer person could call a gas man to my house for an emergency, clunk him over the head, drive into the city and infiltrate every layer of government by saying there's a gas leak! Maybe. It may seem silly on the surface, but it's a privacy issue in an age where protection of privacy is huge. ANYONE can claim to live at my house and receive proof of that through a gas bill. This is big hole in the system that needs to be plugged. This really could be a national security issue just waiting to happen...keep in mind, this is WASHINGTON gas. Plus it puts me at risk of some form of identity theft. There have got to be upwards of 500,000 Washington Gas customers who would like to know they face the same risk. DESERVE to know they face the same risk. I'm not an isolated incident. Again, ANYONE can get proof of residence in my home without me knowing about it! This is Washington Gas' everyday policy! So what's your style? Are you someone who takes your issue to the top or do you stop at the customer service guy? And are you as aghast as I am at Washington Gas' policy around the cancellation and formation of accounts?